Bitcoin, blockchain, virtual currencies – oh my. 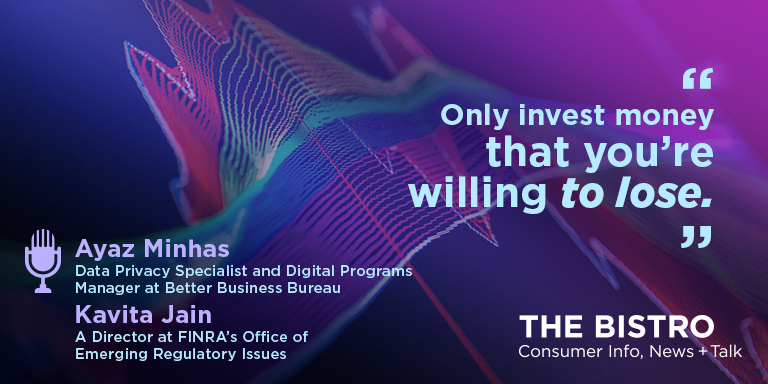 Get ready to demystify cryptocurrency with our guests Ayaz Minhas, Data Privacy Specialist & Digital Programs Manager from the BBB Institute for Marketplace Trust and Kavita Jain, the Director of FINRA’s Office of Emerging Regulatory Issues. They help us all better understand the world of cryptocurrency investing.